Don't miss this opportunity to owner this 70' Azimut, she offers great performance with speeds up to 30 knots. United Yacht Sales New Jersey would love to guide you through a personal showing of this 70' Azimut Motoryacht 2011. 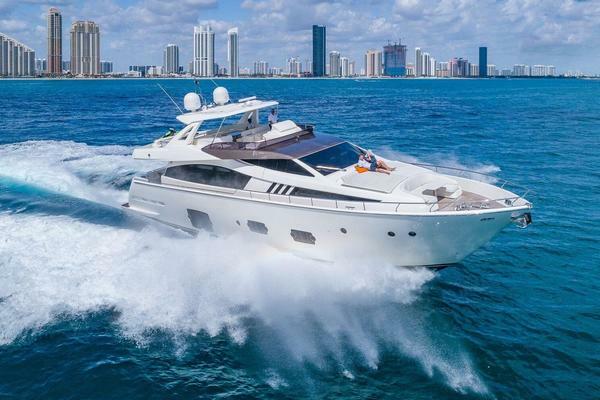 This yacht for sale is located in Miami Beach, Florida and priced at $2,195,000. For a showing please contact us by filling out the form on this page and we will get back to you shortly! "Preliminary Specs" Don'tmissthisamazingopportunitytoownthisOneofAKind70AzimutEvolution.Excellent performance speeds up to 30 knots, powered by reliable MAN V12 1360's. You'll enjoy true pride of ownership behind the wheel of this beauty. Thebestopportunityontoday'smarket. Sheiseasyto see anytime. Boarding the Aft Deck you are greeted with a perfect setting to enjoy moments relaxing or just enjoying the view. Her open Aft Deck is a great area for al-fresco dining, with a built-in settee that can easily accommodate up to eight guests. Large automatic doors open the Aft Deck to the Salon and the two create an expansive area to entertain. Anunprecedentedexpansiveentertainingandloungearea!ThesalononthisAzimutistheperfectarea to enjoy the view. The living space is distinguished by her stylish interior décor. Forward of the Salon is the Galley. The Galley offers stunning views, with one of the most unique layouts. There are accommodations for eight guests in a perfect nook, to comfortably enjoy meals. Directly opposite the Galley is a Dinette, which provides enough room for dining. All the way forward of the master down the companion way is the VIP Stateroom. The elegance comfort and sensuous lines of the yacht are also found here. A queen island berth is easily accessible from either side. The spacious wardrobe provides ample storage for clothing. Tasteful finishes throughout with curtains that are sure to keep the light out on those late mornings in bed. Conveniently located within is private access to the private en-suite head. In between the VIP and the Master is the port and starboard Guest Staterooms with incredible attention to detail and equally sized. The Port Guest Stateroom fitted with queen berth and the starboard Guest Stateroom is fitted with twin berths. Both rooms are tastefully decorated with state of the art amenities. Forward is a full-height hanging wardrobe and the entrance to the private en-suite head. Walk-around decks and a large bow section makes moving around the decks a breeze. There are a lovely lounge and seating area for guests on the bow. Enjoy a meal or relax to take in the sun or stars. Also a great get away for privacy and relaxation, especially while at anchor.